Roasting in Olympia, Serving in Pittsburgh! First thing Saturday morning I head back to the Pacific Northwest because on Monday, Batdorf and Bronson will be roasting one of the finest coffees grown in the world – Panama Esmeralda! Beginning Thursday, August 7th, Tazza D’Oro will be selling and serving the Panama Esmeralda and I promise you’re gonna want some of this coffee. 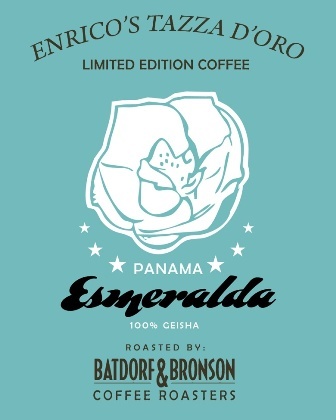 The first time I tasted the Esmeralda I was struck by it’s smoothness and incredible sweetness. This coffee was like no other coffee. My first sip was bursting with tropical fruit- pineapple, mango and papaya. I have been totally obsessed ever since. The Panama Esmeralda has won first place in every competition it’s been in!!! Back in May, Batdorf and Bronson provided Tazza D’Oro with an amazing opportunity – we were involved in the auction of this exceptional coffee. At the end of the day, 2 micro-lots were won from batch 8 and Tazza D’Oro will be offering this special micro-lot Esmeralda coffee to Pittsburgh over the next few months. Tomorrow I will be posting info about the farm where the Esmeralda is grown and processed and why this coffee is so special. Friday, you will have all the details about how we will be brewing and serving the Esmeralda and how you can purchase whole beans from us. Monday will be all about the roasting and cupping of the Esmeralda while I hang with Scott Merle, Green Coffee Buyer and Roastmaster at B&B. As usual, I will also be sending my now famous postcards of my Northwest experiences. I’m pretty sure this one will include a trip to Mt Rainier – it only seems fitting, the day before the roasting of a coffee that is just as magnificent! Woo Hoo! see you on Monday! Esmeralda is a great coffee for sure, but what's more important here is that you've nutured a great crew. There aren't many shops in town where the staff really cares about the details and even fewer where the baristas actually have a passion for coffee. That's the most difficult thing to do in this business. You've built that. And after this crop of Esmeralda is gone, you'll still have a great crew ready to move onto more great coffees. Needless to say, love what you're doing over there. Mama's going to pick up her baby! We'll get her new house all ready for her arrival! Bring me back something purdy, Amy Sue! Rich, Your comment means a lot to us given that Aldo Coffee Co in "one of the BEST". Thanks. We'll be cupping the Esmeralda on Aug 7th at 7pm hope you can make it. Thanks for the invite. It's on my calendar. Looking forward to that.